Affordable entertainer. HP's seven-inch Slate 7 tablet brags to be an able companion for all multimedia situations and is partly available for far below 150 Euros (~$195) despite this versatility claim. We took the manufacturer at its word and tested the Slate 7's capabilities in our test course. According to the manufacturer, the HP Slate 7 is perfect for shooting pictures, listening to music and accessing Google services. The entry-level tablet, featuring a superscript seven in its product name, is based on the popular 7-inch size and HP recommends an affordable 150 Euros (~$195) for it. At the time of writing, some online shops have considerably undercut this price for the Slate 7 by demanding 135 Euros (~$175) for it. The combination of a low price and a modest-sounding field of use do not wake high expectations in terms of software and hardware configuration. However, a look at the spec sheet is reassuring and rouses hopes for a solid performance. 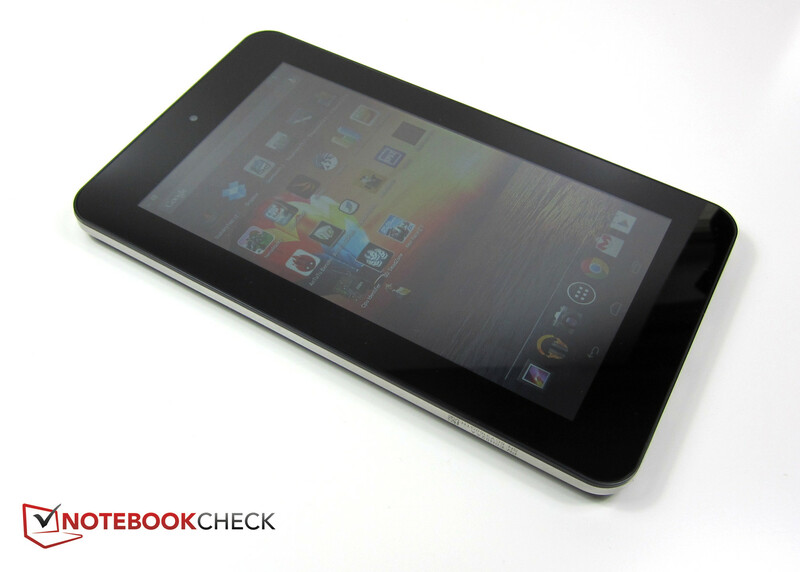 A Rockchip RK3066 based on the swift 1.6 GHz ARM Cortex A9 clocks inside HP's tablet. It has made itself a good reputation as an SoC for low-priced tablets and smartphones. The ARM Mali 400 MP4 supports the dual-core processor and the newer Android 4.1 Jelly Bean version complements the Slate 7 bundle. 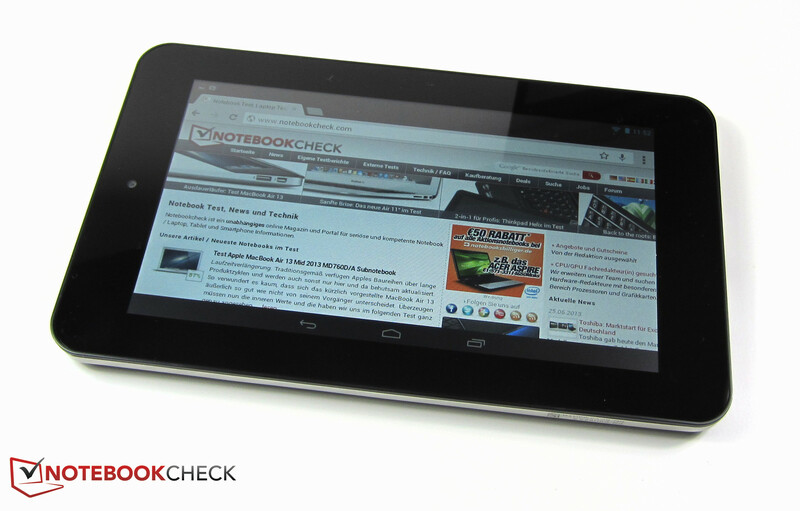 We will describe how the entry-level tablet fares in practical use in the following review. 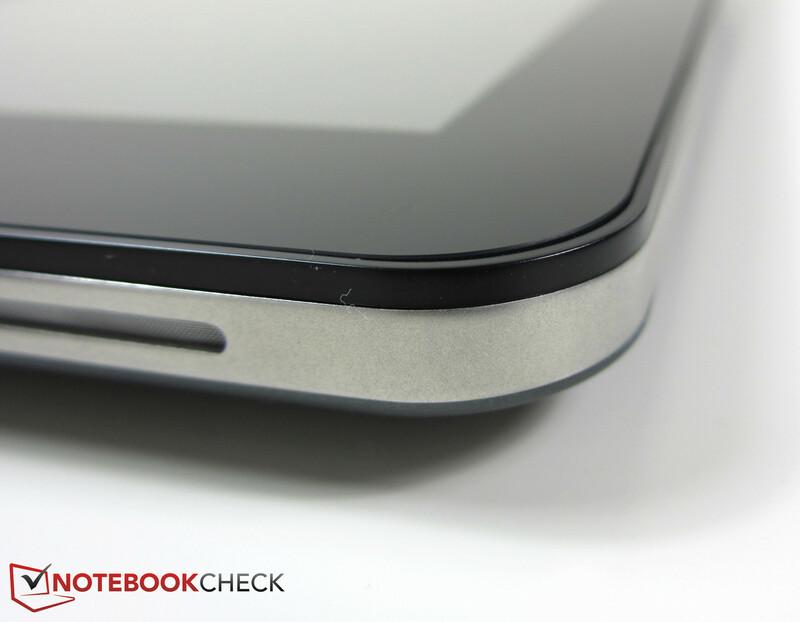 HP relies on a steel bezel to keep the front and back of the Slate 7 Android tablet together. The high-quality build of the review sample's casing barely warps even under higher force and at most yields marginally on the back. A one to two centimeter wide frame that encompasses the 7-inch screen underpins this solid impression visually. The webcam is on the front and only produces VGA quality with a resolution of 0.3 megapixels. The light gray, rubber-coated back of HP's Slate 7 provides the fingers with a firm grip and also features the 3 megapixel primary camera with a resolution of up to 1536x2048 beside the HP's silver logo. HP's Slate 7 is physically a typical member of the 7-inch tablet sector with dimensions of 197 x 116 x 10.7 millimeters and a weight of 370 grams. Google's Nexus 7 and Asus' Fonepad ME371MG feature virtually identical figures in terms of width, height, depth and weight. 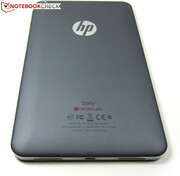 HP also offers the Slate 7 with a red rather than black casing for the same price and configuration. 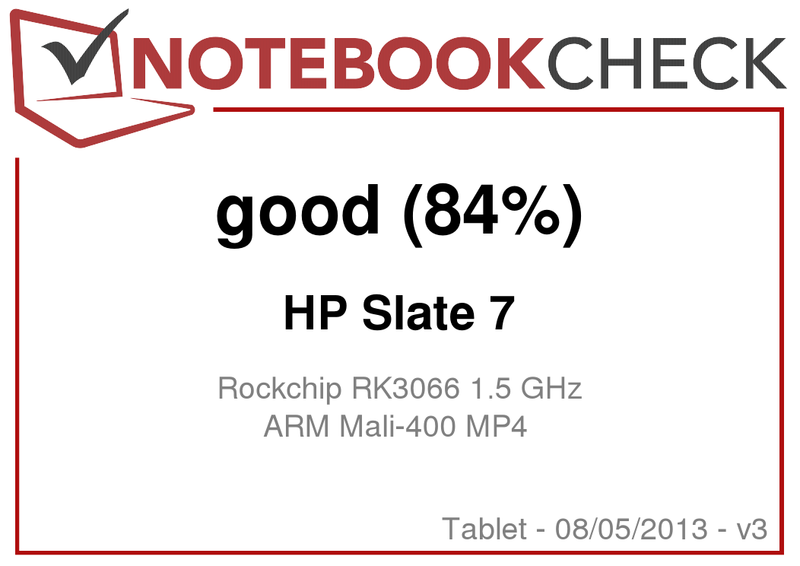 HP's Slate 7 is powered by a Rockchip RK3066 SoC that uses two ARM Cortex A9 cores clocked at 1.6 GHz. 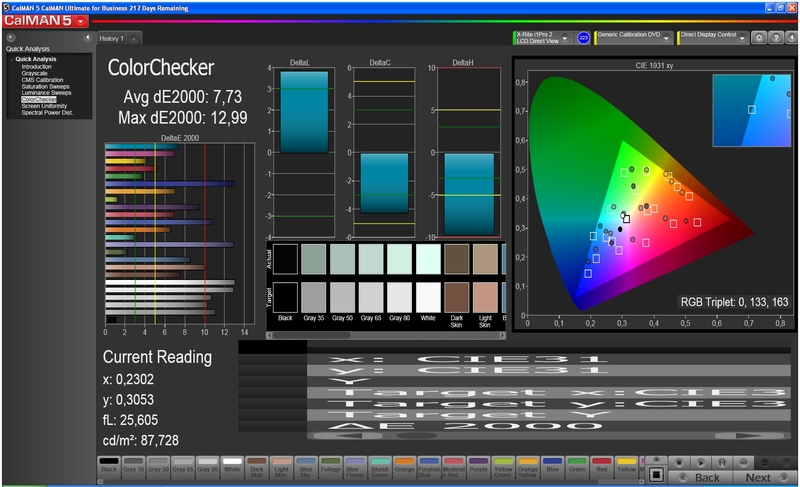 The integrated ARM Mali 400MP4 quad-core graphics takes care of graphic calculations. This one-chip system is mainly used in low-priced tablets and smartphones. The Rockchip RK3066 supports up to 2 GB of DDR3 RAM but it's not maxed out because our review sample only sports 1 GB of RAM. HP specifies the system storage with 8 GB, which is not fully available to the user since the Android OS reserves a part of it. Thus only 5.75 GB is left after initial use. Users who would like to save many pictures and videos on the tablet and use it as HP heralds it will not get far with this storage capacity. It is therefore recommendable to make use of the micro-SD card slot on the Slate 7's top to gain additional storage. It supports up to 32 GB per card. HP equips the Slate 7 with the Android 4.1 Jelly Bean operating system and Google Play along with a few preinstalled apps, such as Dropbox, Google Chrome, Google+ and Gmail. 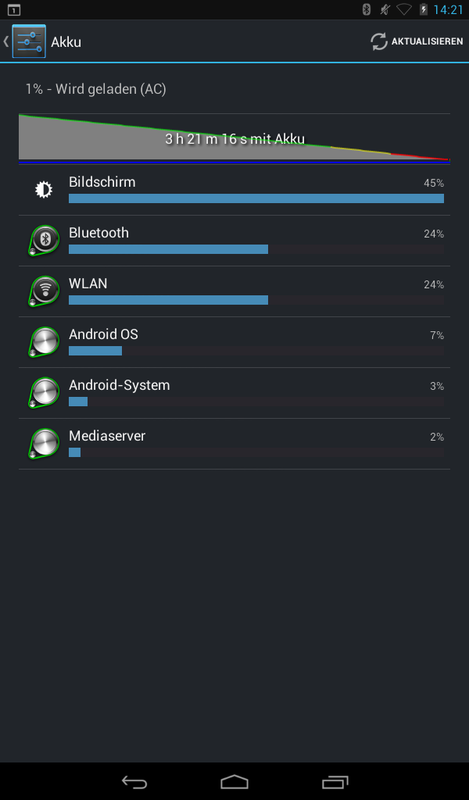 Although there are now newer versions of the Android OS available, it is not a drawback for our review sample. Android 4.2 has caused a few issues since its release in late November 2012 and was reason for system crashes or Bluetooth interruptions, among other things. However, according to Google, these bugs should be eliminated with Android version 4.2.2, which is either already installed or will soon be installed on devices depending on the provider and smartphone or tablet model. 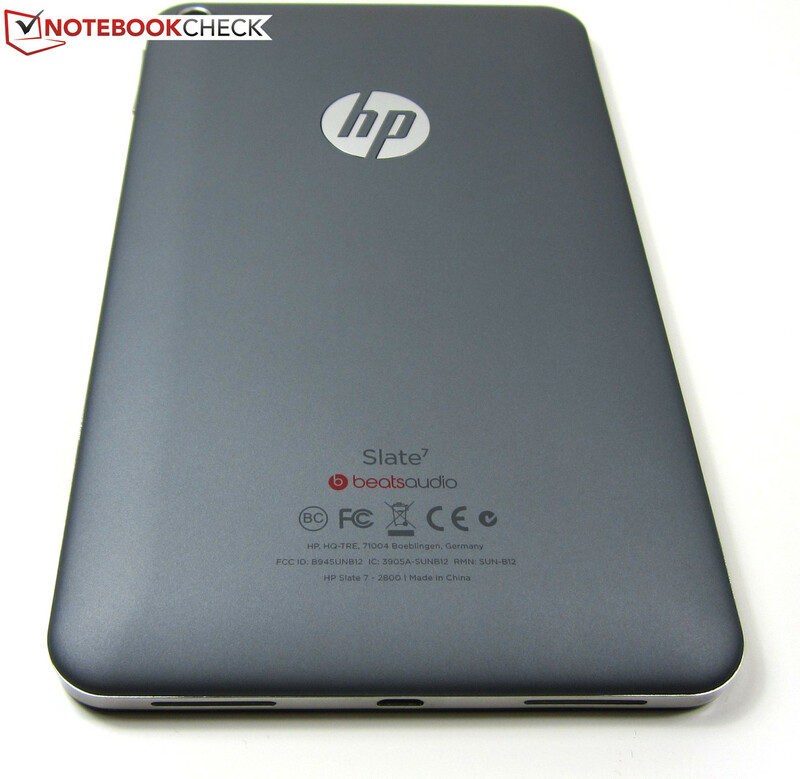 HP does not install a GPS sensor in the Slate 7, which we no more expected than NFC or LTE in view of the price. The tablet does support Wi-Fi standard 802.11 b/g/n and Bluetooth 2.1. Both radio technologies worked flawlessly in the test. 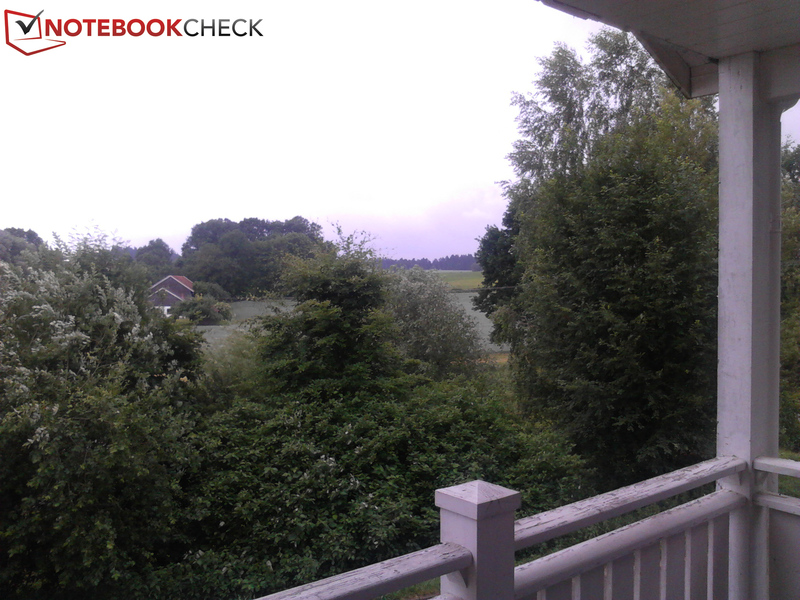 The Wi-Fi connection convinced with a good signal strength both indoors and out. 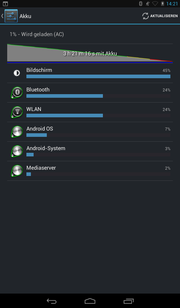 The Slate 7 did not have problems identifying other devices used for testing Bluetooth. HP's Slate 7 sports two cameras. A 0.3 megapixel webcam is on the front. The user should not expect brilliant feats from it due to its VGA picture format of 640x480. However, the given quality is more than enough for video calls, e.g. Skype or Google, or self portraits. The primary camera on the casing's back manages a higher resolution but its maximum of 1536x2048 pixels only achieves 3 megapixels and records videos with only 640x480 pixels. High-detail pictures cannot be expected in view of the fairly weak resolutions. However, the results were almost a complete disappointment. 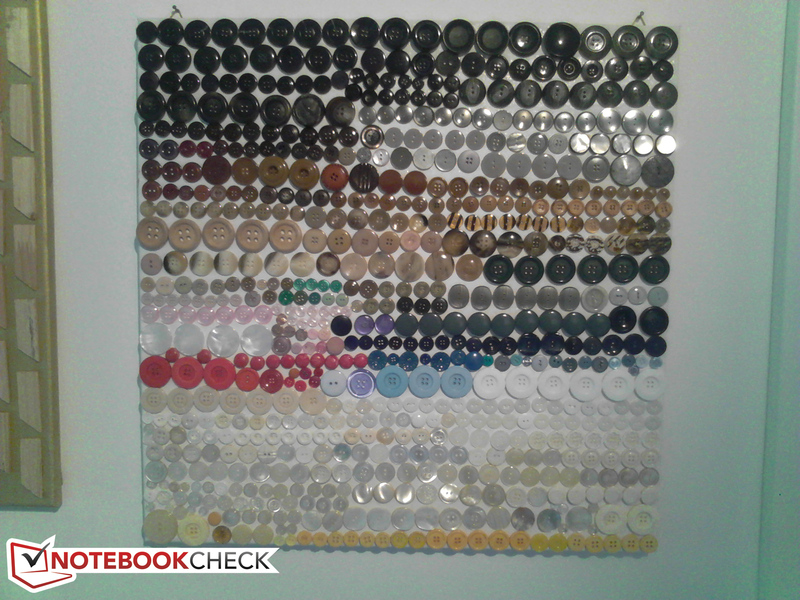 The front-facing camera shoots pictures saturated with noise and that are pale and above all very blurry. The pictures are absolutely useless even when the standard placed on the pictures is set very low. The primary camera had a much easier time than the front-facing camera in our picture tests and can regain a bit of ground. 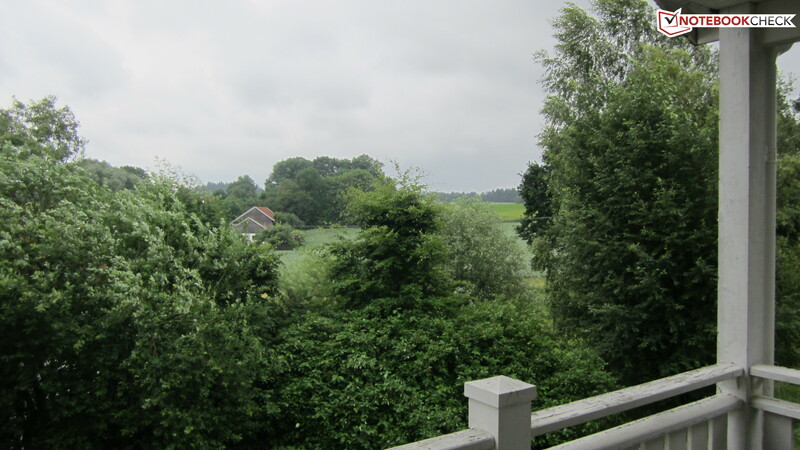 Although the pictures shot in a 4:3 format were not very high-contrast and latently unfocused, they were considerably more feasible than the webcam results. HP's Slate 7 generally reaps in a clear minus point here, particularly when the promised application field is considered to be a standard, which explicitly includes taking pictures. HP currently has a total of four accessory products for the Slate 7 in its web shop. The prices range from 8.39 Euros to 109.99 Euros (~$11 to ~$143): An in-ear headphone HP 100, an external streaming solution HP Pocket Playlist, analog headphone HP HA3000 and a Bluetooth keyboard. 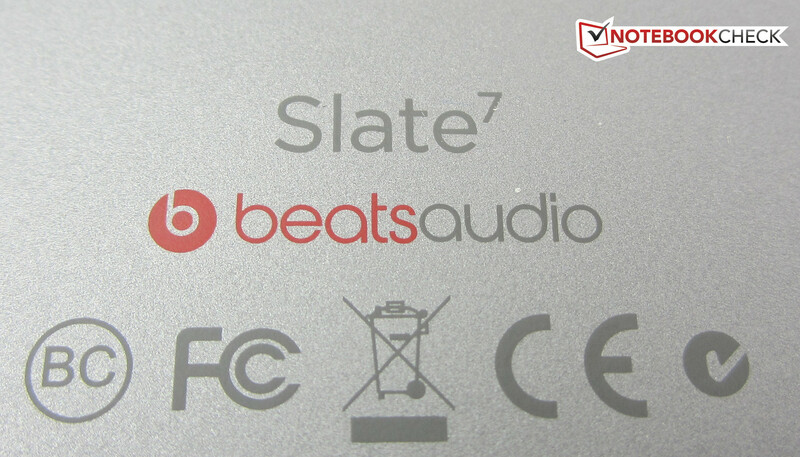 The manufacturer includes a 12 month warranty on the Slate 7. Warranty upgrades are not available. An easy-to-use, virtual QWERTY keyboard is available for entering web addresses and text. The 7-inch screen offers enough room to display the single keys in a convenient size even in portrait mode. It is even possible to type quickly in landscape mode. The touchscreen made a very good impression in the test. 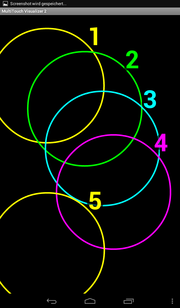 The LC display responded to inputs using up to five fingers simultaneously quickly and without noticeable delays. The content rotated swiftly to landscape or portrait mode and its glass surface enabled smooth usage. The three soft touch buttons responded fast and reliably regardless of the running application. The same was true for both physical keys, i.e. the power button and volume rocker. Overall, using HP's Slate 7 was fun. It did not exhibit any problems in crucial places and the device did exactly what was expected of it. The glass-protected LC display of HP's Slate 7 displays 1024x600 pixels, which is a typical resolution for a 7-inch device. The Saphir SMT 7-inch 3G+GPS, Acer Iconia B1-A71 and Asus Memo Pad ME172V feature the same resolution. Other tablets, such as the Google Nexus 7 or Asus Fonepad ME371MG reproduce 1280x800 pixels. With an average brightness of 365.3 cd/m², the Slate 7 achieves an above-average result and surpasses most competing models. The Saphir SMT 7-inch 3G+ GPS (very low 149.1 cd/m²), Acer Iconia B1-A71 (171.7 cd/m²), Asus Memo Pad ME172V (271.8 cd/m²) and the Google Nexus 7 (280.1 cd/m²) fall behind. 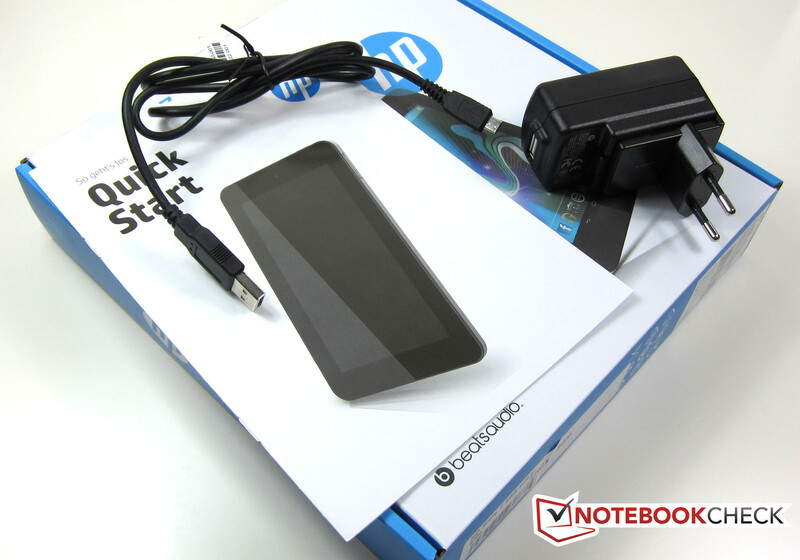 The Asus Fonepad ME371MG comes closest to HP's review sample with 296.6 cd/m². The black value of 0.6 cd/m² slightly lags behind the good brightness rate and HP's Slate 7 only achieves a middling, yet not at all bad contrast ratio of 647:1. All compared devices offer much more here. The Asus Fonepad ME371MG reaps in the best result with a contrast of 1020:1. 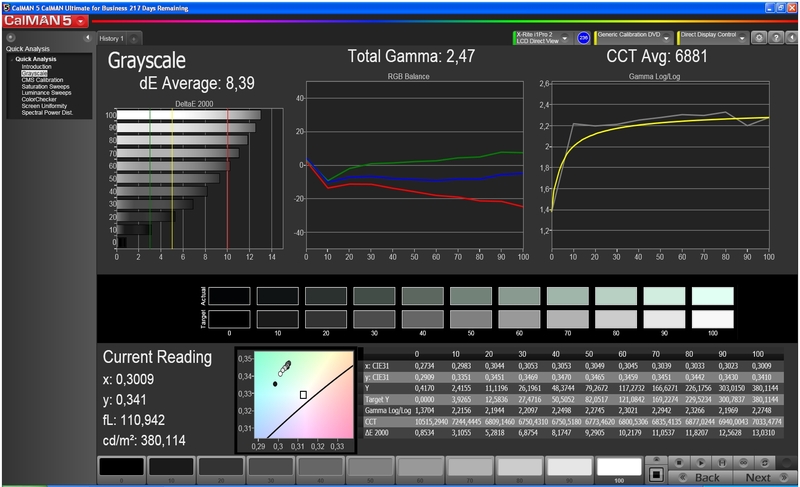 Our assessments using the colorimeter and CalMAN software reveal a few weaknesses of the screen. 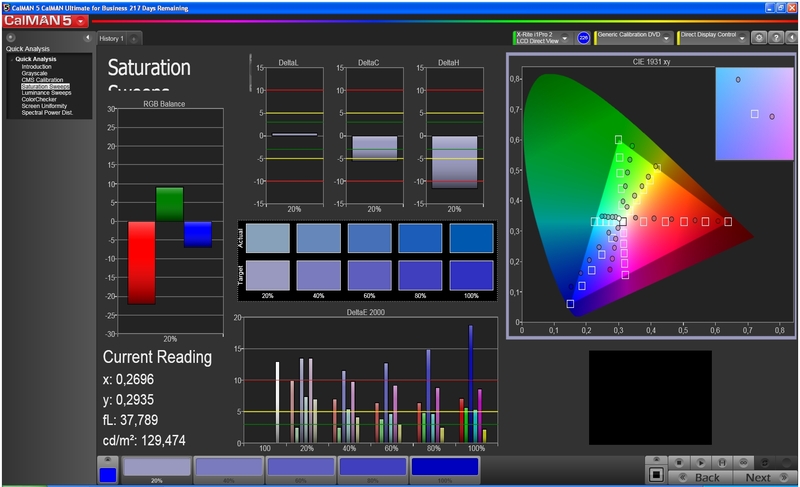 There is particularly a strong deviation seen in the blue hues in the sRGB color gamut comparison. The screen also incorrectly reproduces the grayscale with an increasing white percentage and the average DeltaE of 8.39 is quite high. However, only a trained eye will notice these ascertained weaknesses in practical use objectively. 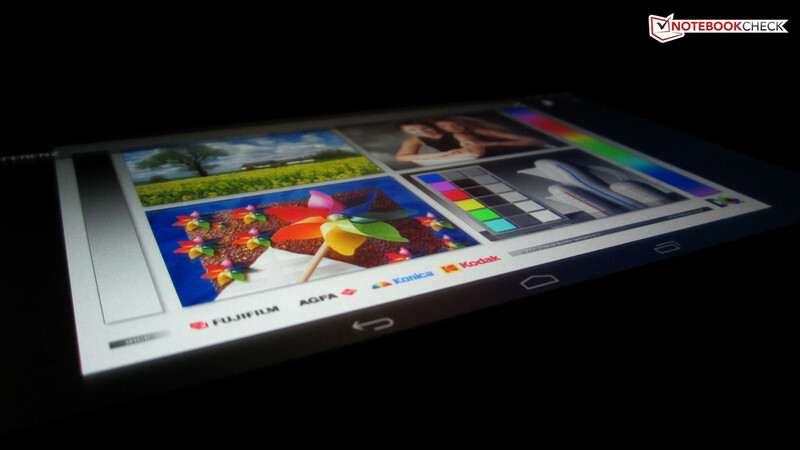 Subjectively, the 7-inch screen renders vivid, bright colors and a saturated black. The screen of a mobile device, e.g. tablets, laptops and smartphones, should at least manage a brightness of 200 cd/m² to be outdoor suitable. HP's Slate 7 achieves almost twice this value and can thus be easily used outdoors. However, the screen's glare-type surface could be noticed adversely in intense light and extremely affect the screen's legibility. 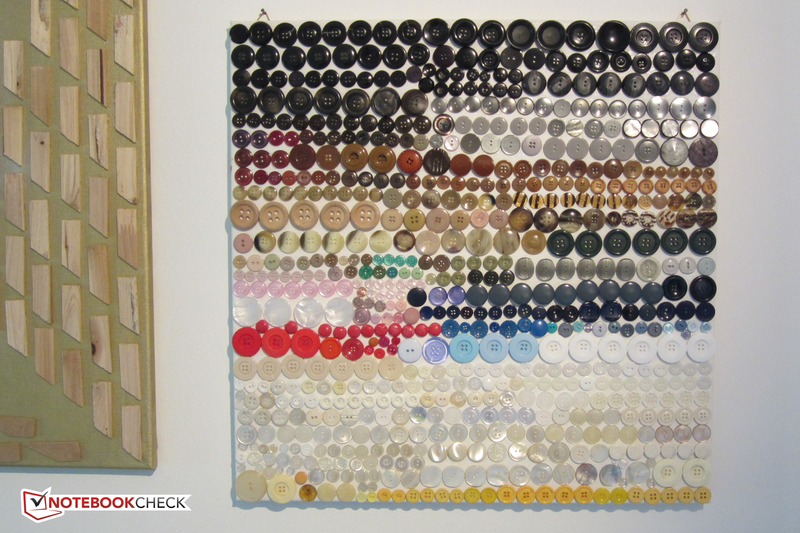 The legibility of text and the color reproduction in pictures are maintained even in wider viewing angles. Distorted, faded or inverted picture areas are not seen in extreme side views. It is only the screen's reflective surface that outshines the content with its reflection of light. The Rockchip RK3066 dual-core processor with 1.6 GHz per core and the SoC-integrated ARM Mali-400 MP4 quad-core GPU form the performance basis for HP's Slate 7. Both use the 1 GB DDR3 working memory and provide HP's tablet with a solid performance foundation. The review sample is on a par with identically or comparably equipped devices in the synthetic benchmarks. 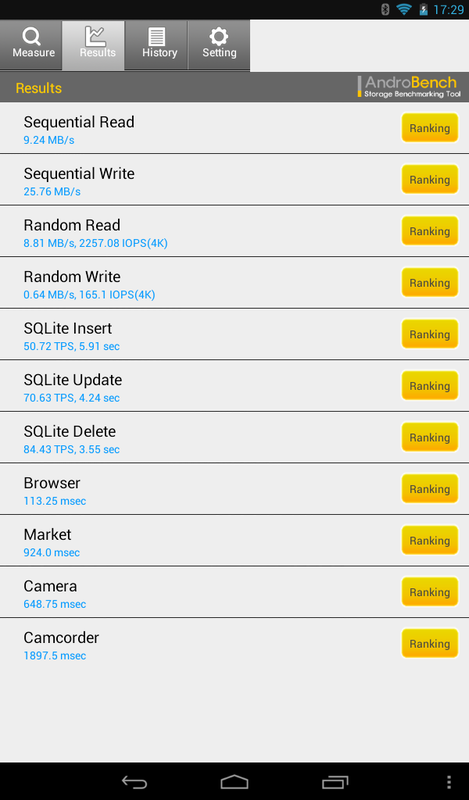 However, it has a marginal lead on the Acer Iconia B1-A71, Asus Fonepad ME371MG and Asus Memo Pad ME172V. 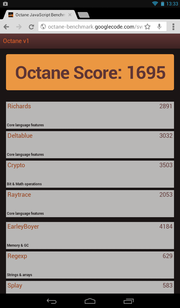 The tablets are neck and neck in the browser benchmarks. 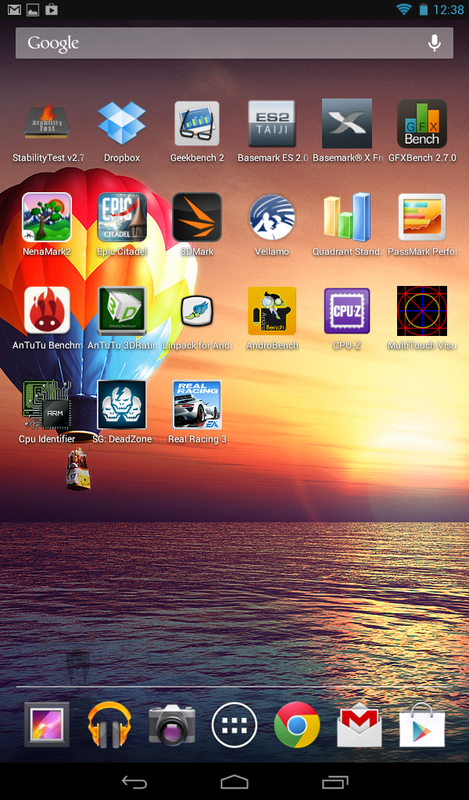 Acer's Iconia B1-A71 lags behind slightly and Asus' Memo Pad ME172V wins the race in the Sunspider benchmark. 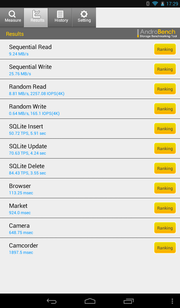 The flash memory installed in HP's tablet has to show its performance in random and sequential read/write processes in AndroBench 3. It does its job quite well, but doesn't manage more than midfield in total. Current 2D and 3D games are no problem for the Slate 7. HP's tablet rendered all tested games smoothly and even computing-heavy titles like Real Racing 3 or Shadowgun: Dead Zone ran without stutters on the screen. HP's Slate 7 stays cool even in full load with an average temperature of 33.9 °C. 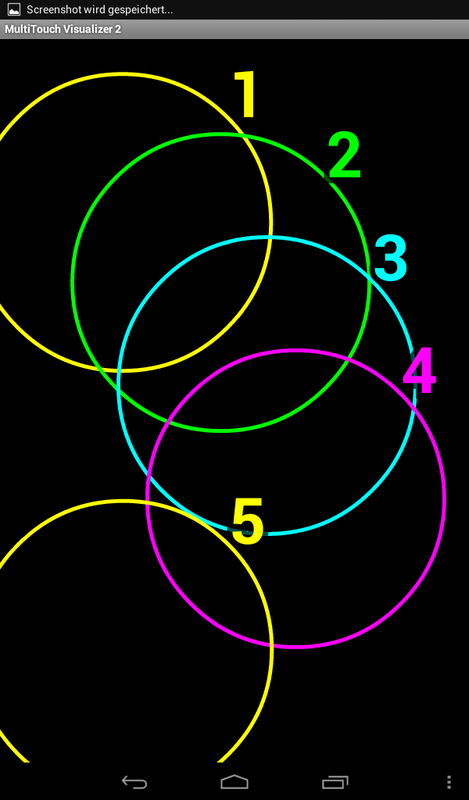 The highest temperature is reached on the front below the screen's center when held in landscape mode. However, 38.4 °C is absolutely within an acceptable range. The device barely heats up more in idle and reaches 32.4 °C. Nevertheless, a few 7-inch tablets fare better: The Saphir SMT 7-inch 3G+GPS only reaches an average of 32.5 °C in load and the Asus Fonepad ME371MG only warms up to 30.5 °C. According to HP, the Slate 7 particularly feels comfortable in the multimedia field. The quality of the integrated stereo speakers might not be the purchase deciding factor but it certainly contributes to the overall impression. For exactly this reason, HP installs the Beats Audio HD sound system in its tablet and makes this very visible with the corresponding red logo on the casing's back. The stereo speakers in fact supplied a decent sound quality in the test but lack mids and particularly bass even when the Beats Audio function is enabled. The audio enhancement was first really noticed when headphones were connected and the midranges as well as low pitches came to the fore much more. Regrettably, HP does not include headphones for the Slate 7 and only offers them as purchasable accessories. HP's Slate 7 wakes hopes for long battery runtimes with its consumption rates. The review sample consumed 1.3 to 4.3 watts in idle and 5.9 to 6.3 watts in load. The 7-inch tablet is just as energy-efficient as identically or very similarly equipped devices. Acer's Iconia B1-A71 (6.2 watts) and Asus' Memo Pad ME172V (6.4 watts) are almost equally battery sparing. The Saphir SMT 7-inch 3G+GPS is the most power-hungry with a load consumption of up to 6.9 watts. The non-removable lithium-ion battery in the Slate 7 has a capacity of 13.4 watt hours. However, it cannot thrust the tablet to the top ranks in battery runtime in the test. HP's tablet lasted for 3 hours and 21 minutes using maximum screen brightness and all wireless technologies on. This minimum runtime is a good rate. It looks different in the other direction, in the test for maximum runtime using minimum screen brightness and all wireless connections off except for Wi-Fi. The Slate 7 ran for a relatively long time with 14 hours and 10 minutes but only places itself in the midfield. Google's Nexus 7 (17 hours and 38 minutes) and Asus Fonepad ME371MG (18 hours and 54 minutes) last much longer. Contrasting that, Asus Memo Pad ME172V shuts down after just 8 hours and 11 minutes. The Wi-Fi test comes closest to real use behavior. Here, the screen's brightness is set to 150 cd/m² and a script automatically opens websites every 40 seconds. HP's tablet delivers a very good performance with 6 hours and 55 minutes in the comparison. Google's Nexus 7 (6 hours and 50 minutes) and Asus' Fonepad ME371MG (6 hours and 49 minutes) are almost just as good. HP's Slate 7 proved to be a solid 7-inch tablet in many ways during the test. First, it is not a second rate device despite its affordable price. It is well built and features a bright, high-contrast and viewing angle stable LC display. Second, HP was not tightfisted with the innards. The combination of a Rockchip RK3066 dual-core SoC and an ARM Mali-400 MP4 quad-core GPU supplies all over sufficient power for applications and games. Compromises do not have to be made with the operating system either. 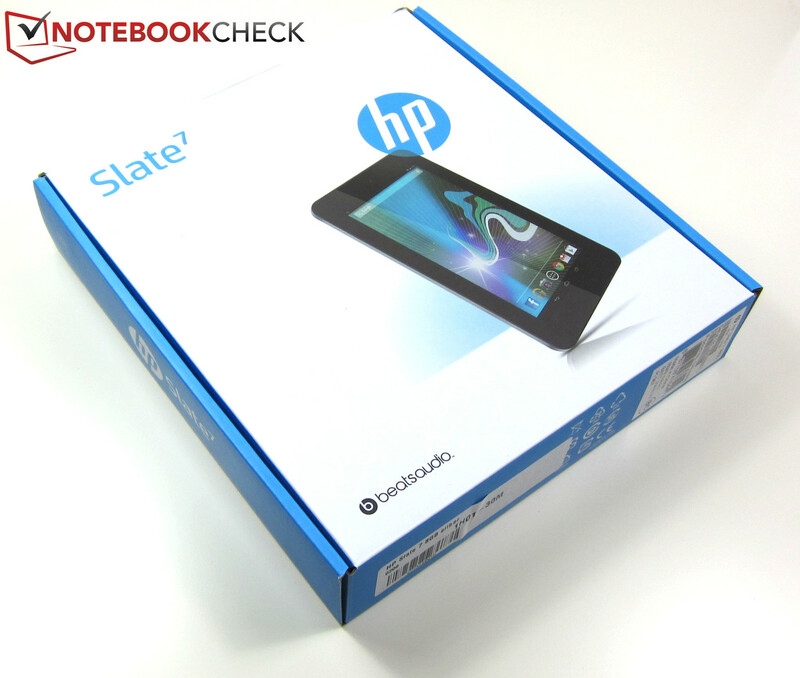 HP's Slate 7 makes use of an up-to-date version of Google's OS with Android 4.1 Jelly Bean. To meet the multimedia claim, the Android tablet relies on the Beats Audio HD sound system, which can develop its full potential with headphones. They are not included though. The Slate 7 blunders with its camera modules. Users who want to take pictures with the 7-inch tablet will find a just still acceptable picture quality from the 3 megapixel primary camera. In return, the webcam shoots miserable quality pictures. Disregarding the lapse in the cameras, HP's Slate 7 is in total quite compelling. HP's Slate 7 has an RRP of 150 Euros (~$195), but is already available for around 135 Euros (~$175). 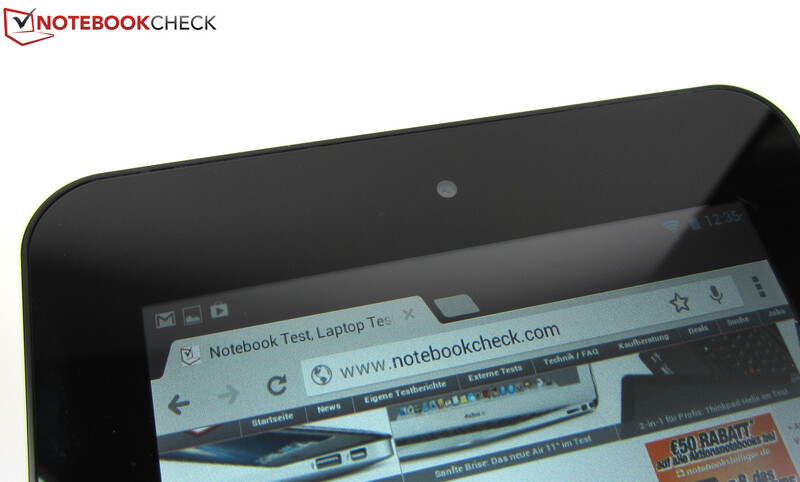 The 7-inch tablet is framed by a one to two centimeter bezel. The rubber-coated back provides the fingers with a good grip. HP's Slate 7 convinces with its high-quality build. The multi-touchscreen detects up to 5 finger inputs simultaneously. ...that can be clearly enhanced via the integrated Beats Audio HD sound system, particularly when headphones are used. 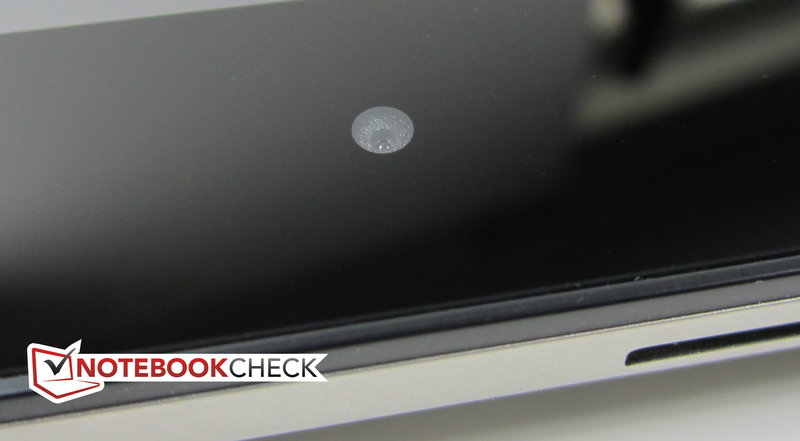 The front-facing camera only has a resolution of 3 megapixels. 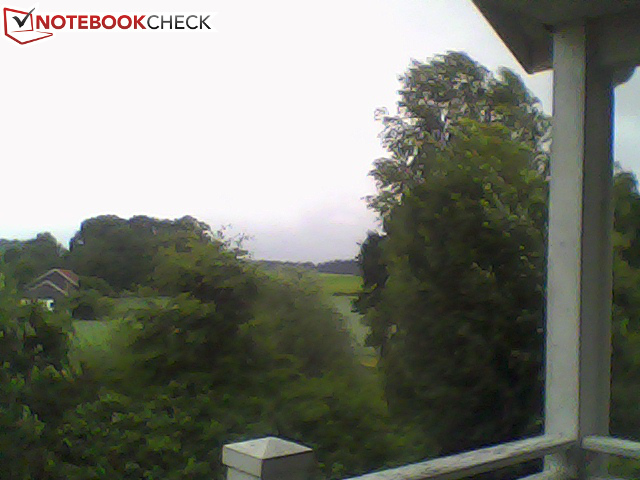 The 0.3 megapixel webcam shoots virtually unusable pictures. 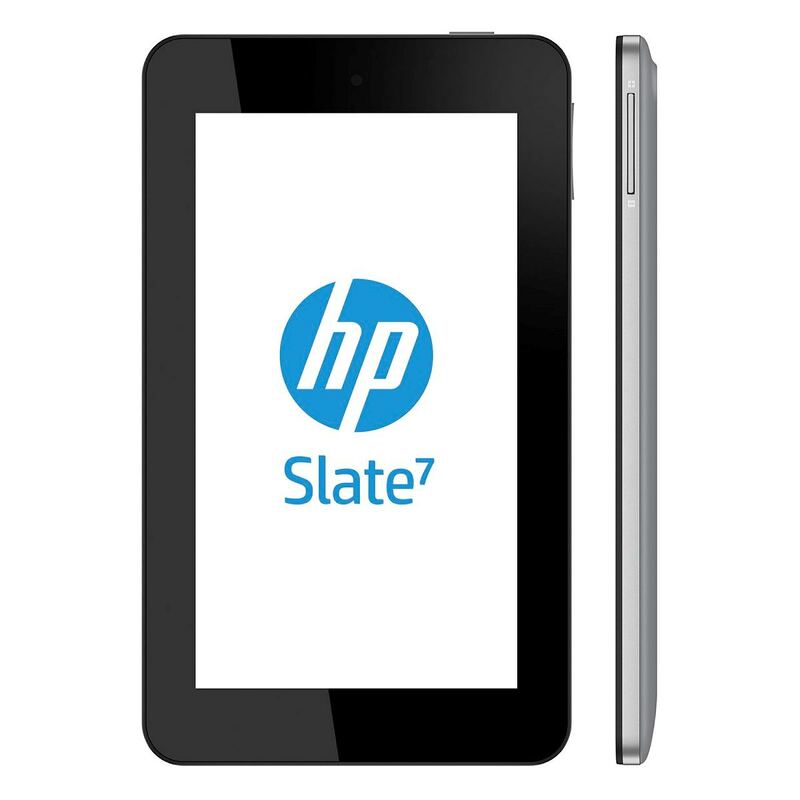 The Slate 7 expands HP's Slate tablet family. 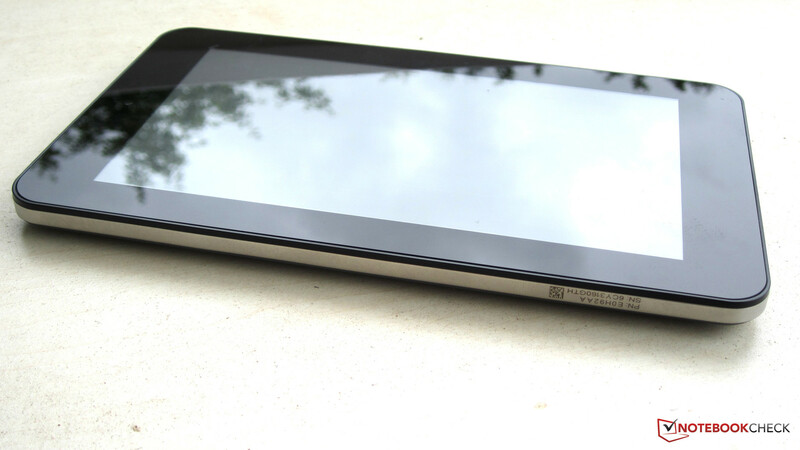 HP's Slate 7 is outdoor suitable despite its very reflective screen. Clearly arranged: The start screen of Android 4.1 Jelly Bean. The battery in HP's tablet lasts for 3 hours and 21 minutes in full load. 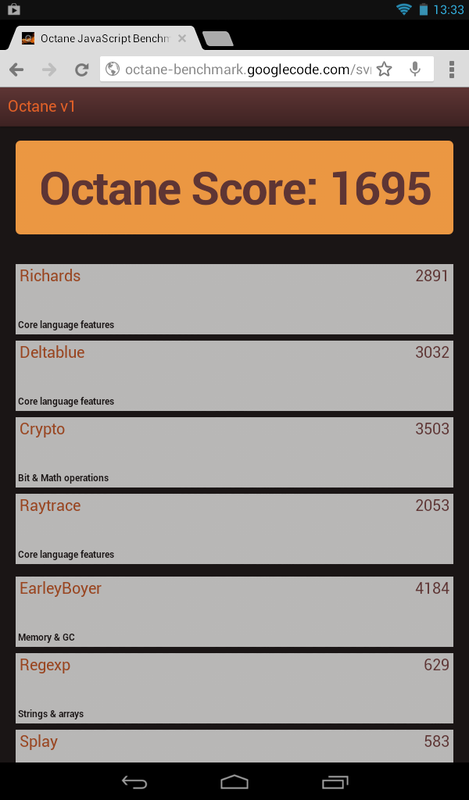 Benchmarks, such as Google Octane, certify HP's Slate 7 to have a good application performance. The flash memory in HP's Slate 7 provided a middling performance in read and write. The good performance despite the budget price. The Rockchip RK3066 SoC delivers enough power for all requirements placed on games and apps. 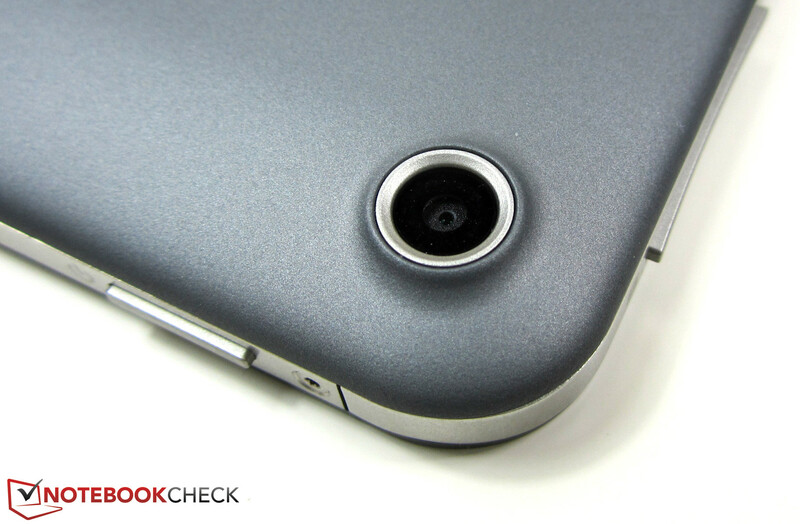 A tablet that boasts multimedia use should feature better camera modules. 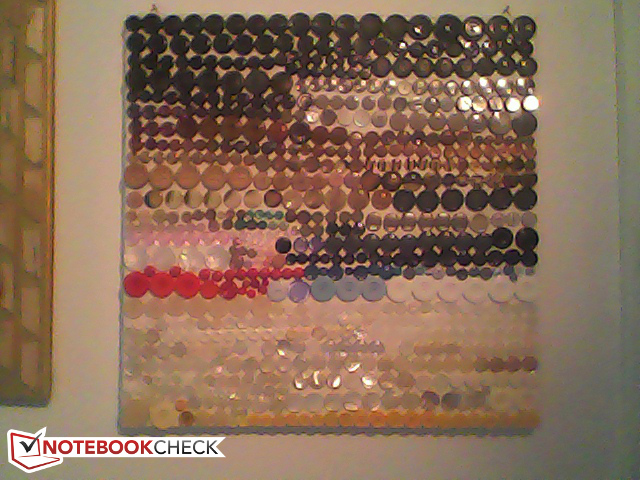 The webcam is virtually useless although the 3 megapixel primary camera shoots feasible pictures. 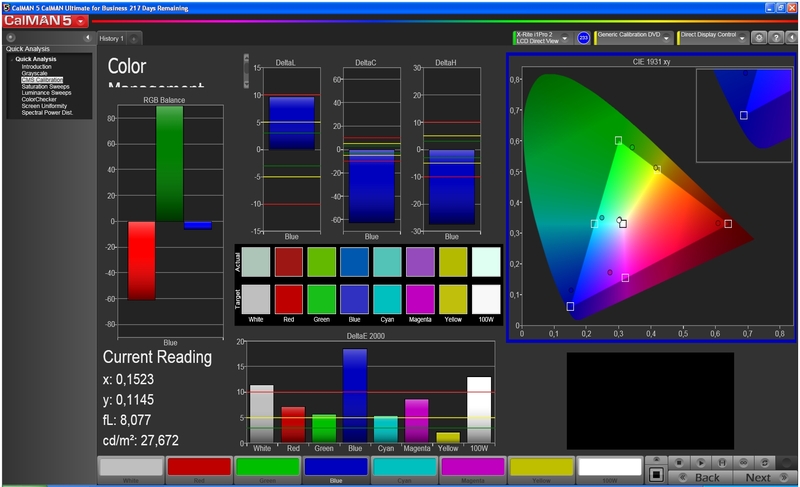 The LC display's high viewing angle stability and brightness. The screen subjectively offers a high reproduction quality despite not quite perfect rates.